My move this past winter was a merely 3 hours south, you would have thought I moved to a new country. You can get away with saying just about anything as long as you include.. Bless their heart, after it! There are certainly gals who say it and mean it completely. It is just a natural saying for them, raising in Kentucky. It is so sweet and charming. Such southern hospitality. "Your hair looks like the back end of a muskrat.. Bless your heart! " "You are going to be doing school until you are an old man, Bless your heart". Too funny.. though I suspect as time rolls on, I along with all of the other Kentucky enmeshed gals, will be saying it completely without even stopping to think. Cause that's just how its done down here! I looked high and low for a piece of jewelry or art work that said this well known phrase during Kentucky Review week. They are out there, but not as readily as I had hoped. I was able to work with an Etsy site 6:21 Treasures to offer you a gorgeous necklace to celebrate Kentucky Review week!! 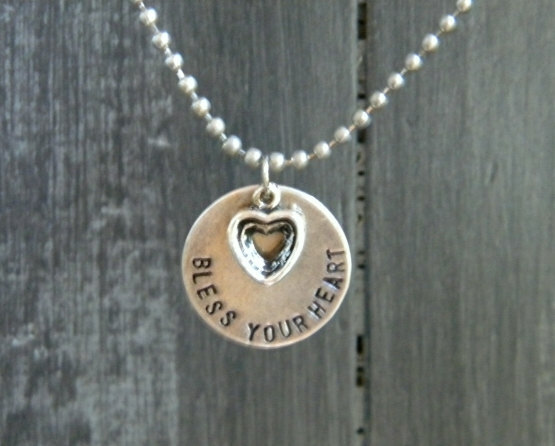 Wear this Bless Your Heart necklace and think of southern hospitality with a bit of tongue in cheek humor. I covet this necklace as I have only been given one to giveaway to my beloved readers. I must surely secure a necklace soon to wear in my new Kentucky home! A Christian, Homeschool Mama, what a blessing. I love the Custom Handstamped Silhouette Prayer Necklace. I would need to add another 9 silhouettes - one for each of my grandchildren! My favorite item is the Handstamped Sterling Silver Family Tree Necklace. I like the Verdigris Feather and Leather Cuff Bracelet. I like the Walk by Faith necklace. I love the Bless Your Heart!!!!! Skeleton key and city necklace. I really like the Antique Brass Keyhole Bracelet :) Lots of possibilities there! love the bee sweet copper necklace! The Antique Brass Keyhole Bracelet. I like the Etched Copper Initial Family Name Necklace.